Jor-El and Lara test the spacecraft that will send Kal-El to earth in a computer simulation, and it fails, again and again. Jor-El laments his failure to succeed along with his failure to convince the Kryptonians, a great race, that their planet is doomed. He recalls how the civilization gave up war for a better Utopia, only to fall to their own short-sidedness. Jor-El, in a panic, searches for the best possible place to send Kal. Ultimately, he finds Earth. He reassures Lara that the planet will make him more than safe.it will make him a man of tomorrow. They send him, just as the planet explodes, and the spaceship takes minimal damage. Life support, however, still wanes. It grows less and less operative over time, but it still makes it to Earth. There, we see a montage of Kal growing up as Clark Kent. As a toddler, lifting a tractor. Lex Luthor. Lana Lang. 25 years later, in Africa, Clark stops a bullet from hitting a man, Kobe Asuru. Rebels try to detain him, but he wants to follow the man who shot at Kobe. They tell his to stay, and Clark tells Kobe that he admires his work as an activist. They go to a bar together, where Kobe explains that though racism is not present in his homeland, tribalism is. Kobe's sister is wary, but Clark Kent tells her that he is not there to serve the oppressive regime that is sapping their culture. She tells him about how Lois Lane did similar things a year ago in the same region. Clark says that he'd like to meet her. Clark tells her he is 25, and still looking for a place in the world. She tells him to be himself. Clark notices the masks around the place, and comments on their symbolism in various countries. As he does so, heavy weapon fire smashes the club. Clark curses and attempts to take hold of the situation. He grabs Asuru, and heads for a van. On the way, he is shot in the back, but he plays it off as having been torn in a fight. Asuru's family berates him, but Clark assures him that the fight they are waging is worth the price. Story - 3: Okay. Start out with a great story about Superman. We have the Jor-El. We have the Lara. We have the ship, the space, the tension, even, I would say, a well written re-start for the origin. New looking ship, nice little bit about the life support, heck, even the fact that Earth wasn't chosen a while before the disaster is okay. Take us to an overly (but well overly) dramatic opening, which takes several pages but is worth the wait. Then look, folks! Clark lifting tractors, Lex Luthor on the sly, Lana Lang, a young Ma and Pa Kent! Actually, at this point, I was pretty jazzed. Then cut to a 25 year old Clark Kent who curses and drinks beer in Africa fighting for political revolutionaries, along with a sermon on culture and how it is subsumed in modern oligarchy. Well...okay. But what the heck does that have to do with the promised definitive re-imagination of the Smallville Superman. Isn't that what this was supposed to be about? I mean, if I'm going to read a mini on political revolutions and oligarchy, fine. Even throw Superman in. Just don't promise one thing, start delivering (the GREAT opening), then suddenly shift gears into, well, for lack of a better adjective, crap. Preachy crap. We've seen so many scenes like this already. Clark finds some culture he doesn't know about, is enlightened, helps save the culture in some way, then leaves, better for it, only to never even mention or remember those people again. That's not really great for the long term, and this is supposed to be a re-defining series. I mean, I see enough of that kind of stuff in the newspapers, remarkable given that Superman works for one. Don't get me wrong.I'm not against enlightenment. I am against the CHEAPENING of enlightenment by making it a political buzz plot. 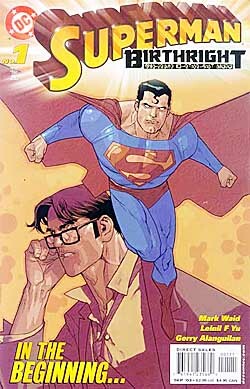 "The story of how Clark Kent became Superman continues, as he gets involved in a political conflict in Africa." Read that again. I did. Shouldn't it say, "The story of how Clark Ken became Superman continues, when a wet behind the ears Clark Kent has his first major meeting with a power hungry Lex Luthor." Or the like? We had Luthor in the opening. I want my Luthor. African revolutionaries? I mean, come ON, people. There's a reason the years Clark spent learning are never covered. They're boring. Smallville is covered because it was exciting. Clark was not borderline Superman, which is what we have here. He's inexperienced and vulnerable. That's what I'd hoped this series would be about. Maybe it still could be. Let's hope. Art - 5: Superb work. Slightly less Superman-y than I would have liked, but still, a nicely done piece. The scope is absolutely well done, and it takes you right into the story, particularly the voyage with the young Clark through the depths of space and the destruction of Krypton. I really enjoyed this issue. Cover Art - 2: IN THE BEGINNING. Let's go all biblical. Superman looks like he's going unconscious and having a bowel movement at the same time. Young Clark is wearing glasses. He didn't. The colors are nice, I'll give them that. The logo stinks. Great Superman, classic, but then, BIRTHRIGHT, evil alien style. Doesn't make sense.